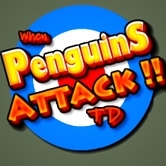 I this Tower Defense game are the penguins ready to attack. Your goal in this funny game is to save the human race from being destroyed by the penguins. Try to beat each level without losing any lives Add build defensive towers on strategic locations.